As soon as you click the “ALLOW” button, this not-at-all-actually-Google Docs app now has permission to read your emails and email all your contacts… the latter of which it’ll start doing pretty much immediately, spreading the worm to pretty much everyone you’ve ever emailed. This one is super sneaky; pretty much the only way to detect it before falling for it is to click the small “Google Docs” link on the actual Google-hosted page and notice that the developer info seems… off. Update: The Google Docs Twitter account just acknowledged the attack and says they’re working on it, but says not to click on things in the meantime. We are investigating a phishing email that appears as Google Docs. 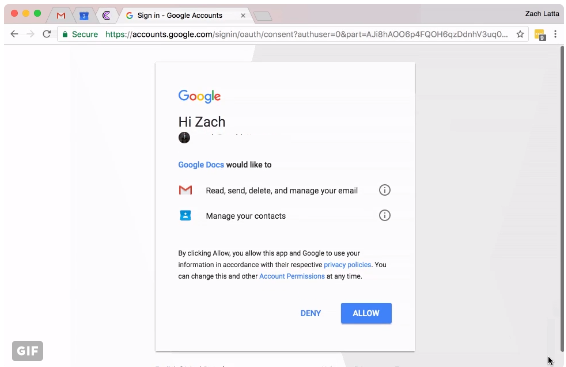 We encourage you to not click through & report as phishing within Gmail . Update: Google says this specific attack should be blocked now, and they’re working on preventing similar attacks moving forward.